MBA in Healthcare & Hospital Management Systems,BITS Pilani. PG Diploma In Infectious Diseases,Medvarsity. PG Diploma in Clinical Cardiology,John Hopkins University,USA. Institute of Ultrasound training, Jefferson Ultrasound Research Institute (New Delhi affiliate),Philadelphia, USA. PG Diploma in advanced sonography,Institute of Ultrasound training, Jefferson Ultrasound Research Institute (New Delhi affiliate),Philadelphia, USA. 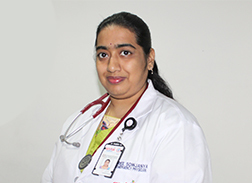 MBBS ,M.S Ramaiah Medical College, Rajiv Gandhi University of Health Sciences,Bangalore, Karnataka. MD in accident & Emergency Medicine,Vinayaka mission university,Salem, TN. Experienced in all Emergency Critical Care procedure. • Vice-President - Society for Emergency Medicine. • Vice-Chairman for Gender Specific Group of SEMI. • Received EPI STAR AWARD for contribution to emergency medicine at PACE 2015 at Yercaud, Salem,Tamilnadu. • Received Best Doctor Award from BHEL in 2016 at Hyderabad. • Received SEMI Excellence Award for contribution to Toxicology at EMCON 2012 at NEWDELHI. • University Third rank in MD. • Role of IJV Venflon Vs Central Line in Resuscitating critically ill patients in ED at INDUSEM 2008 held at Coimbatore. • Oral Research Paper Presentation on Outcome of Endosulphan Poisoning-Newer Concepts at GAPICON-2009. • Poster Presentation on Outcome of Endosulphan Poisoning Propofol Vs Thiopentone in Effective Seizure Control at CRITICARE 2010. • Poster Presentation on Dependability of ECG in Potassium Abnormalities at CRITICARE 2010. • Poster Presentation on A Visual Manometer-Role of USG guided IJV Diameter in measuring CVP at WINFOCUS-2011.